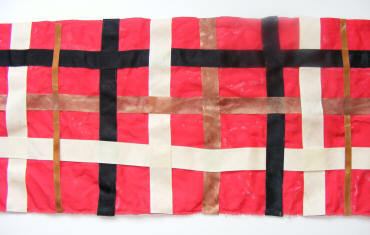 This very messy craft gives children an idea of how tartan patterns are formed. If you are doing this as a group activity, provide a large collection of ribbons and fabric and you will be surprised how many different variations of tartan you will get! Cut 3 or 4 lengths of ribbon the same length as your fabric and lots of pieces the length of the fabric width. Glue the long pieces of ribbon along the length of the fabric. Quickly glue the shorter pieces along the width weaving in and out of the longer pieces. The ribbons will be movable until the glue dries, so you will have to be fairly quick. When your fabric is dry trim any overhanging ribbons. Why not use your tartan to make your teddy his very own kilt? Scotland is, of course, famous for its tartans. Why not have a go at designing your own with this tartan painting idea?